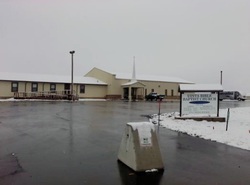 Welcome to Uinta Bible Baptist Church Online! We are so excited that you are taking the time to visit our website. If you're looking for a church family in Evanston or just want to learn more about Jesus, come on in. There is always something exciting going on at Uinta Bible Baptist Church. Our programs provide excellent opportunities to know God better. We offer everything from small-class Bible studies, to exciting music, and an inspirational atmosphere. Our services are friendly and straightforward. We're excited about Jesus and sharing Him with you. There is something for the whole family at Uinta Bible Baptist Church. We hope to see you soon in one of our worship services! JD Daniels and his wife Wendy were both saved and baptized at Uinta Bible Baptist Church. JD has been an associate in the church since 2006 and was called by the church to become Pastor in September 2017. Wendy is our pianist and general musical coordinator. The Daniels have 4 children: Tori, Sami, Chelyn, Jaxson. The Daniels girls all participate in our music program singing special music in groups, choir, and solos. Jaxson loves to help greeting and passing out bulletins. Mrs. Daniels is also employed at Uinta County Independent School District #1 as an Instructional Coach.